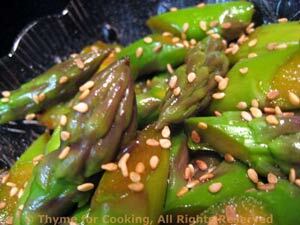 Sesame Asparagus or Chinese Asparagus Salad, Thyme for Cooking easy sides. Adapted from the book of '!,000 Chinese Recipes), this is wonderful as a vegetable, on a bit of lettuce as a first course salad, or as part of a Chinese meal. It's best served at room temperature. Roll cut asparagus in 1 inch (2.5 cm) lengths. Fill large saucepan half full of water and bring to a boil over high heat. When boiling drop in asparagus and parboil for 2 minutes. Spread them on paper towels and pat dry. In a bowl big enough to nicely hold the asparagus mix soy sauce, sugar and sesame oil. Add asparagus and toss lightly to coat. Sprinkle with sesame seeds and serve. Best if allowed to sit for 15 - 30 minutes.